Perhaps because of its tannic backbone and structural profile Clos de la Bussière has long flown under the radar. To be sure, Clos de la Bussière does not have the immediate allure or charm of Roumier’s Chambolles. I remember being deeply impressed with the 2012 when I tasted it from barrel a few years ago. 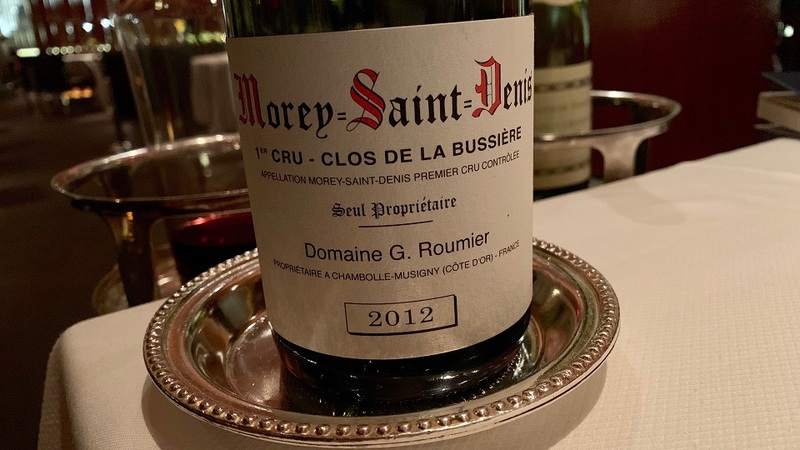 Back then, I wrote “A cool, reticent Burgundy, the 2012 impresses for its persistence, delineation and intensity… I wouldn't open a bottle before its tenth birthday, as this is a wine that has always repaid cellaring. I expect that will be the case again within the 2012. This is a fabulous showing. Stylistically, the Clos de la Bussière is classic Morey in its pure power.” I felt the same way tasting the 2012 recently. As Burgundy lovers know, 2012 was a vintage with abnormally low yields that resulted in deep, concentrated wines. Today, the 2012 shows all of the richness of the year in spades. The natural intensity of the red stone fruit provides a striking foil for swaths of tannin that lurk beneath. Floral, spice and mineral notes develop in the glass hinting at the complexity that will develop over time. With a little air, the 2012 is drinking well today, although it has more than enough pedigree to age beautifully for many years to come. Readers lucky enough to own the 2012 should be thrilled. It is a superb bottle! 93/Drink 2020-2040.